Equine Guided Empowerment® is a unique modality developed through the life-long practice of somatic presence, spiritual curiosity and union with horses of Cassandra Ogier. Equine Guided Empowerment® provides opportunities for participants to ground and center, quieting the mind, through reflection and interaction with horses. Through Somatic Reprogramming® techniques, participants are guided to align themselves in their body in reclamation of self-acceptance, authenticity and expression in the present. Participants experience the ability to regain their voice, advocacy and sense of true-nature, so they may recommit to their values and unique purpose in the world. Horses are naturally and intrinsically grounded in the present, their sense of self and their individuality as a unique expressive being, as well as awareness of their oneness with the herd. This metaphor for our lives and our available connection to source underpins Equine Guided Empowerment®. Somatic Reprogramming® is an embodied authentication experience developed by Cassandra Ogier. Through somatic exercises aligned with horse herd dynamics and nonverbal communication beyond the intellect, participants become aware of their centered presence. This centered presence evokes curiosity and fresh perspective based on the truth of what is happening in the moment, rather than trauma based responses associated with past experience. Our bodies appear to hold stored memory of trauma, shame and oppression. When we challenge ourselves through certain movements associated with claiming our individual right to space, boundary setting and honoring our inner wisdom, we can experience a release of needing to protect, defend, prove or dissociate. This validating action of our bodies changes our thinking and old beliefs, revealing to us our true, genuine nature and valid potential, uncovering trust in ourselves, understanding our own needs and the separate experience of others with compassion, without compromising or losing oneself. Talking and thinking our way through life challenges does not work. 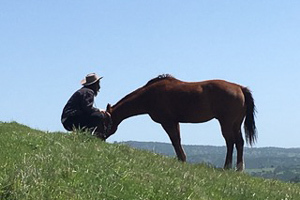 Somatic Reprogramming® verifies our true nature and innate wisdom through experiential interaction with horses, offering an embodied approach to changing our actions and reactions, supporting fresh thinking and connection in the world. No riding experience required, all sessions take place on the ground.